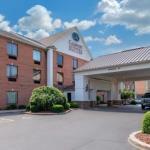 The 81-all suites Comfort Suites Airport is a five-minute drive from the Louisville International Airport and the property operates a complimentary shuttle. Other items included with the room rate are a deluxe breakfast bar, a managers evening reception, high-speed Internet access, local telephone calls, a newspaper on weekday mornings, in-room coffee and parking. There are banquet and meeting rooms available for business or social functions that can accommodate 150 guests. There is a golf course, movie theatre and casino nearby. Other area landmarks and attractions include the University of Louisville, Churchill Downs, Six Flags Kentucky Kingdom, the Louisville Zoo, Papa John's Cardinal Stadium, the Kentucky Derby Museum and the Kentucky Exposition Center. All the suites have a large work desk with high-speed Internet access, telephone with voicemail, refrigerator, microwave oven, coffeemaker, television with cable movie and news channels, iron and ironing board and a hairdryer. Handicap accessible suites are available. This inn has an indoor heated swimming pool and an exercise room. The 24-hour front desk has information on area events and attractions. Other amenities include a business center with copy and fax machines available for guest use, a coin-operated laundry, valet cleaning service, cold weather hookups, daily housekeeping and vending machines. The complimentary breakfast is the only meal served here. Restaurants nearby include Frischs Big Boy, Ruby Tuesdays, an Outback Steakhouse and a Shoneys.